I was lucky enough to grow up on the island of South Uist in the Outer Hebrides where my dad worked as a general surgeon/ G.P. in the small Sacred Heart hospital in Daliburgh for 25 years. I went to Lochboisdale Primary School on the island until the age of 11 when I was punted off to boarding school in Edinburgh. As a child I was very much into the outdoors and I used to head off on my bike to the beach or muck about at the local canal. I golfed a bit; did some fly fishing on the lochs; played with friends at the local dump; all very idyllic really. I wasn’t particularly academic so the fancy Edinburgh school was a bit wasted on me with one school report for maths saying ‘Shona has been working steadily but with progressively less understanding’. I was good at sport and art. I studied Audio Visual Aids Technology at Napier College in Edinburgh. I could have gone to art school but I didn’t fancy 4 years studying anything at the time and the A.V.A course was 2 years, with my attendance being part time! Part of the course involved film production and photography which I liked a lot but the rest of it was pretty dull. After toying with a few jobs in Edinburgh when I left college, I headed to London working at Hammersmith and St Mary’s Hospitals producing teaching aids for medical students and nurses for 4 years before getting a portfolio of artwork together and trawled round publishing houses until I started picking up commissions to illustrate books and produce artwork for advertising agencies. A move to Glasgow followed (husband relocated there with work) and I supplemented my income as an illustrator working as a tennis coach after qualifying as a coach with the Lawn Tennis Association. Then I had my daughter Cathy, dropped the coaching, but continued working from home as a freelance illustrator and looked after Cathy full time. Photography came later. Who (photographers, artists or individuals) or what has most inspired you, or driven you forward in your own development as an artist and photographer? The most inspiring thing for me is the British landscape. Its wonderful seasons and skies and trees and coasts and islands and moors and uplands and…and…and… Trying to do it justice photographically is a constant and enjoyable challenge. Next up for inspiration are painters and print makers. I really like the work of Joseph Crawhall and James Guthrie, two of The Glasgow Boys who were a group of about 20 artists working in Glasgow (oddly enough) in the early 1880’s. It’s lovely stuff. Crawhall used to work with gouache – a sort of professional poster paint – on linen which is quite an unusual technique, and one that I’ve used for some of my paintings. Nowhere nearly as accomplished as his though. Another painter whose work has inspired me is Walter Sickert. His colour palette and technique with oil paints is fabulous. The wood engraver and illustrator Charles Tunnicliffe is another whose work has influenced my own as is the artist and printmaker Norman Ackroyd. His etchings from his visit to St Kilda in the Outer Hebrides are wonderful and very evocative of the place. Although Paul Strand’s book “Tir a Mhurain” had a great impact on you, you credit your father as being one of your biggest photographic influences? Yes he was. He was a very accomplished amateur photographer and watercolour artist with his work published in magazines and books and he had lots of exhibitions of his watercolours once he retired. I spent a lot of time watching dad working in the darkroom while chatting away. We moved to an NHS house near the hospital when I was 5 and dad was able to make a darkroom in the loft space (the door to the darkroom was salvaged from the SS Politician of Whisky Galore fame). Up until then he had his darkroom had been in the under stairs cupboard – much bumping of head. I used to love watching the whole darkroom process and found it quite magical. When I was a little older I was allowed to ‘help’ with the various stages and I learnt so much. He used to take photographs of island weddings as a favour to the families as there weren’t many islanders with cameras in the 60’s and 70’s. I sometimes helped by standing on a chair holding the flash gun if it was needed. Dad had a copy of the American photographer Paul Strand’s book Tir a Muhrain that I used to look at and still do. Strand had visited South Uist for 3 months in 1954, 2 years before Dad arrived to work there and he was greatly taken with the photographs in the book. It was made all the more interesting to him as the people in the photographs were now his patients and so he knew some of them very well. He himself photographed many of the islanders over the 25 year period that he worked there and there are some wonderfully powerful portraits. I think because he had a real connection with the islanders and had a great respect for them, it comes across in the photographs. You’ve said that your memories of growing up on South Uist still influence many aspects of your life, including your photography? I go back to South Uist every year even though I have no family living there now. It’s such a lovely wild place and holds so many memories for me. For those who don’t know it, it’s very flat on the west of the island and rugged and hilly on the east. It’s dotted with thousands of peaty lochs and the west coast has a special fertile area of land called the machair which is spectacular in spring when it’s covered with tiny wild flowers. There’s a beach that runs the full length of the island on the west coast. There is always a wind and the skies are huge. It has a peaceful quality that I hope to find when I’m out looking for new locations to photograph where I live in Aberdeenshire. I’ve found a place near my home called The Cabrach that very much has those qualities, and some of the north east coastline has some of the winter wildness of Uist. Did anything in particular prompt you to become more serious about your own photography? Very much so. My daughter left home to go to university in 2014. Suddenly I had space in my life for photography again. In my twenties when I left college I had been a keen photographer when I could process the images myself in my darkroom. I say darkroom – but it was the bathroom in a shared flat that I used to convert into a darkroom. Blacking it out took ages and people interrupting to use the facilities eventually wore me down and I got my photographs printed by TruPrint or Boots. That removed half of the creative process for me and my camera only got an airing taking family or holiday photos. I came late to digital photography and bought my first camera, a Canon 40D in 2012. With the computer, back came the creative aspect of processing that I had originally found in the darkroom and photography seemed to have a point again. When Cathy left home I found I had time to go out to make images and I did that a lot. I went to South Uist on my own for two weeks in the autumn of 2015, just me, my camera and the dog and I learnt so much. I went out every day no matter what the weather, mostly all day, and in the evenings I’d process some images. It helped that I knew the island so well. How does ‘home ground’ feed your image making – living in rural Aberdeenshire and having ready access to 40 acres of wild mixed woodland next to your house? The wood surrounding my house sparked my interest in returning to photography. I walked through it every day with the dog and so I became very familiar with it. It’s a mature mixed woodland with Scots Pine and Birch trees with the central bit very boggy. My initial attempts at photographing it were so woeful because it’s a very complicated wood with fallen trees and branches everywhere. What I really liked about the wood was that it’s easy to omit the sky and so you can create a good feeling of depth. After 2 years of making images of it, I feel that I’ve really managed to get its character across. I lived next to the wood for 10 years but I moved house last year and I’m now surrounded by open farming Aberdeenshire countryside, and it’s very different. There’s not so much woodland but there are lines of trees planted along the borders of fields. As I said, it’s very open countryside with big skies and always the wind, not dissimilar to South Uist in that respect. It’s taken me a while to find images within this landscape, but I have and it has formed a new project based on lines on the land created by the various agricultural processes. The Aberdeenshire coast is 30 minutes from my new house and I’m quite familiar with it because I’ve been photographing it since 2014. All along the coast are what were originally small fishing villages, such as Pennan where Local Hero was filmed and Collieston which takes the full force of an easterly gale. There is also the Sands of Forvie which has the most wonderful sand dunes. About 40 minutes away are some fantastic Scots pine woods near Banchory with huge mature trees and if I go the same distance inland I can be in the Cairngorms National Park. Lots and lots of landscape photography opportunities. I’m also really happy just walking from the house with my small Panasonic LX7 camera and photographing anything that catches my eye. You’ll go out, make an image, review it at home and then sometimes return the same day to fine tune the composition? I certainly used to work that way when I had the wood next to my house. It’s sometimes hard to tell from the back of the camera if the image is as promising as you think it is, so sometimes I’d walk the 5 minutes back to the house and check the image on the computer. I could clearly see if there were any weak points in the composition and also any ‘planty’ problems. Sometimes I’d go back with the lopers! A sort of physical Photoshop technique. I really don’t like spending time working in Photoshop and I’ll avoid it if I can. My use of it is incredibly basic and I’ve never used a layer. It probably shows in my images but I don’t think it’s a bad thing. What was it that prompted you to start making artists’ books? Has anyone in particular influenced you in this? I wanted to do something with my photographs. I’d printed some but not many. Having my own photographs framed and on my wall didn’t appeal much. Holding an exhibition is expensive unless you sell a lot of frames and there are no guarantees of that. I’ve successfully had my photographs selected for inclusion in the Royal Scottish Academy Open Exhibition each time I’ve submitted which is very nice and it makes exhibiting more affordable when it’s shared with a lot of artists, so I’ve gone down that route but there aren’t too many of those type of exhibitions and of course you don’t necessarily get selected. I like the book form very much and as a book illustrator it seemed a natural road to take. I’ve got a bit of a weak spot for pop-up books and I love Fungus the Bogey Man by Raymond Briggs. A few years ago I bought a children’s book called Where My Wellies Take Me designed and illustrated by Olivia Lomenech Gill. It’s wonderfully thought out with lots of fold out pages and text on opaque sheeting. It really caught my imagination and inspired me to learn how to make books, ones that can bring in other dimensions like a pop-up book or an artists’ book, so I went on a bookbinding course at Peacock Arts in Aberdeen run by the master printer Michael Waight. I had quite a clear idea of what I wanted to do and so I questioned the poor man endlessly over the 2 day course. I bought myself some basic bookbinding kit and started making simple books pretty unsuccessfully at first. After a year of constantly making books and portfolios I got reasonably accomplished at it which allowed me to develop all my ideas. Artists’ books are brilliant things. These aren’t books as many photographers think of them, but works of art in themselves and you seem to be continually pushing the boundaries of what they are or what they might be? They use the book form or book structure as a starting point, and can be fairly traditional or quite sculptural and are produced in small editions or as one-offs. They come in all shapes and sizes and their forms can be simple like a concertina or more complicated like a tunnel book. Some are stitched; some don’t use any adhesives or stitching but rely of folded paper interlinking. All of my books are handmade and use original artwork or photographs ink jet printed on fine art papers such as Hahnemuhle or Fotospeed and they’re not reproductions. I collect all sorts of paper and I’ve a plan chest full of lovely ones, lots of them handmade from the Far East or India and Bhutan. I think my most favourite make is a hand screen printed paper from Japan called Chiyogami which comes in the most fabulous designs and colours and when pasted to book boards feels like a little like a fabric. I sometimes use natural materials in my books such as pressed leaves and I’m experimenting all the time with things that I can use. Paper texture is very important as I want the books to be tactile and I put a lot of thought into working out whether to use a smooth, rough or opaque paper that lends itself to the image printed on them. Do you have an idea for the form of a book in mind from the outset, or does this emerge from printing and sequencing images? It depends. Sometimes an image lends itself to a certain form of artists’ book. The woodland tunnel book came about that way. The image was taken on a wet and very windy January afternoon in the wood and there was movement all around apart from at the centre of the photograph. I thought a number of layers with decreasing central circles would accentuate that. I also like that when it’s opened, the concertina resembles the bellows of an old box camera. By the time I get to printing and sequencing a set of photographs I’ve got a finished book in mind. Would you like to choose 2 – 3 favourite photographs – or books – from your own portfolio and tell us a little about why they are special to you? The tunnel book that I’ve just mentioned is a favourite of mine, partly because it was quite difficult to make and I was really pleased how it turned out. It takes on a completely different dimension when it’s lit from above. All the circles are accentuated. Needless to say it’s a one–off book and I was delighted when a well-respected photographer and book maker bought it to add to his collection. 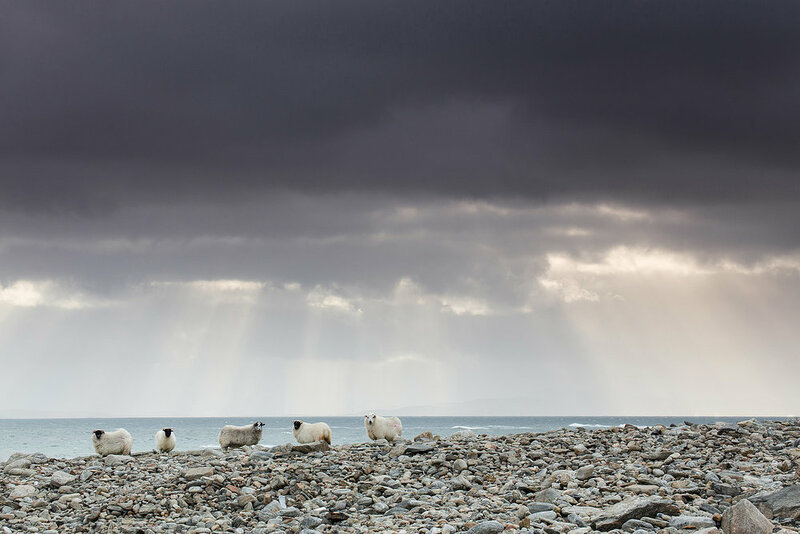 My other favourite photograph that I took is of 5 sheep on the shore at Bornish Point on Uist with Barra in the distance. It’s so evocative of the place and it seems whenever you stop to take a photo on Uist there’s always some sheep observing you from a safe distance. Bornish Point is also a very special place to me. It’s where the land juts out into the Atlantic beyond the reef and if there’s a gale it’s the most exhilarating place to be with huge breakers rolling in. Because you are out on a point you can watch them roll past quite close to you and see them from behind as they roll on towards the beach. Finally, there’s a photograph from my Land Lines photo project of Aberdeenshire fields that I’ve just completed (I think). It brings back to mind a wonderful December afternoon last year when I was out looking for shapes, colours and textures in the land. 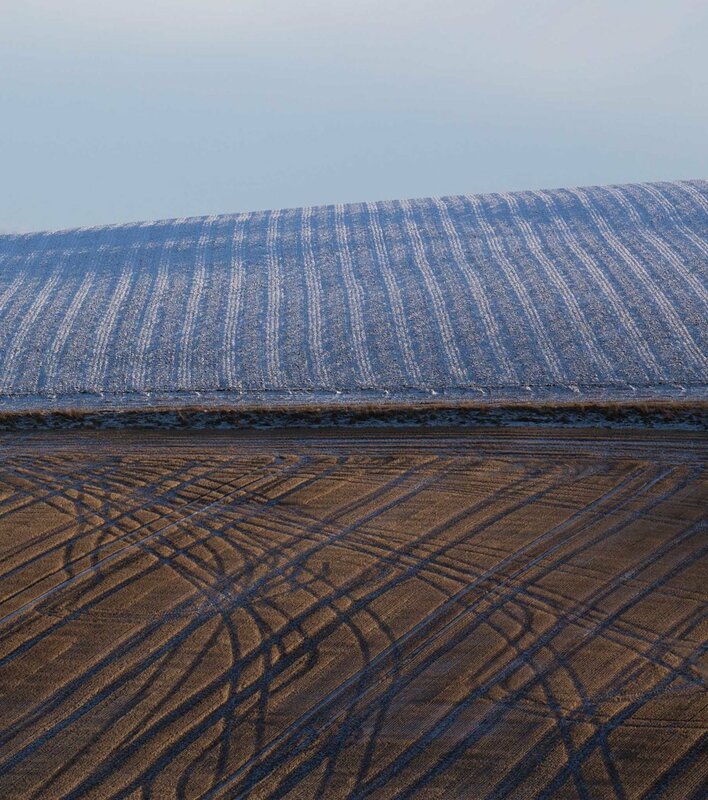 The low light really brought out the textures on the stubble field in the foreground and the ploughed field on the hill top with its light dusting of snow. I didn’t need to do anything to the image – just a simple crop. Do your books now shape or influence your photography and if so how? How do you think that your photography may evolve or change over the next 5 years? Gosh! 5 years. That’s a long time. My photography has change a fair bit since I started image making 4 years ago. Technically I’ve got better at using my camera and filters and it’s become more intuitive which has freed me up to concentrate on the images that I’ve got in mind. I can’t really think what my photographs will be like in 5 years because I’m constantly changing how I work, so it will evolve. I used to use a tripod all the time, but with my Land Lines project I had to ditch that because sometimes I just didn’t have the time for it if I’d had to park on the verge next a busy road or it was too windy. I quite like that way of working now. 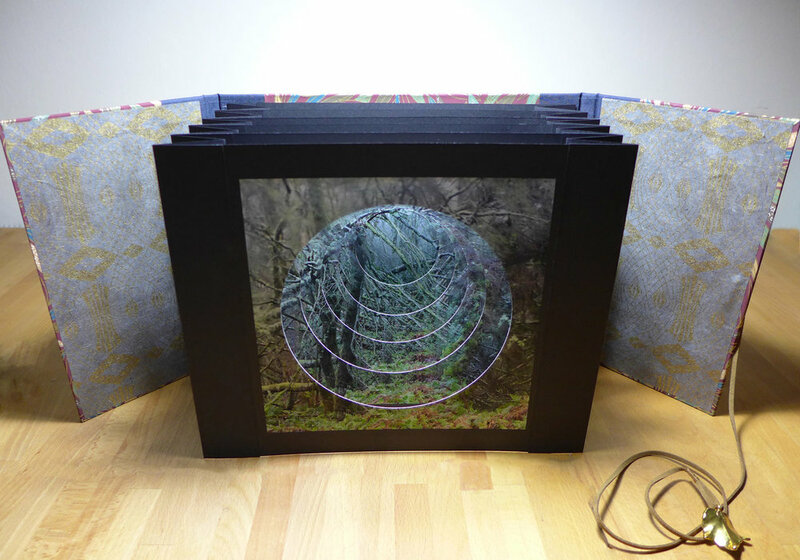 I’m very much a photographer who makes books and not a book maker who takes photographs. The books are a means of showing my photographs and the quality of the photographs is very important to me and something I work hard at improving. Do you have any other plans, projects or ambitions for the future? I do indeed. At the moment I’m working on a more traditional 50 page large format photobook of my Land Lines project. I’ve more than 100 images to choose from and I’m busy sequencing and designing it. Depending on how tricky it is to make with various papers and foldouts it will be a limited edition of 5 or 10. Since October last year I’ve had my books selected for inclusion in book fairs at the Impressions Gallery in Bradford, Stills Gallery and Fruitmarket Gallery, Edinburgh and with the LensThink/Print Stuff exhibition in York. I’ll continue to apply to book fairs both here and abroad but there’s a lot of competition to be selected so I’ll see how it goes. My books are now selling overseas and are in small collections, so it’s all very encouraging. You’ve said that you still have your father’s photos – do you think that one day you will feature them in one of your books? I’ve got all his 2x2 and 35mm negatives but I don’t think I’ll make a book with Dad’s photographs mainly because I don’t want to profit from his work. I’ve produced two books of his black and white photographs with my sister that were published by The Islands Book Trust a few years back which were very well received. We donated our royalties to the South Uist home for the elderly that is now located in the old hospital that Dad worked in at Daliburgh. I love growing vegetables and I’ve just dug a large veg plot in the new garden. I’m busy building a wall round it made from old slate roof tiles. I really enjoying cooking (all those veg) and bread making is a favourite. I knit a bit and I’ve knitted 2 Eriskay jumpers that are quite complicated because they are made all in one piece and I’m currently half way through studying part time for a BA (Hons) degree in Arts and Humanities specialising in Philosophy and Art History. It doesn’t involve maths!